Well I am officially equipped and dressed to save the universe now! This suit is absolutely fantastic - as with the majority of Indy's work, the pictures on here simply don't do the actual garments justice, you really have to see and feel the quality for yourself. 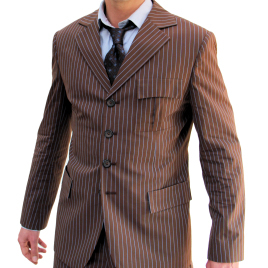 The suit is perfect, from the faux flap-pockets (as seen on the show) right down to the sharp electric blue pinstripes running through the brown fabric. If you're a fan of the show you really won't be disappointed with how screen-accurate the suit is. Aside from the Doctor Who-angle to it, the suit itself is a beautiful cut and if you can afford to purchase the custom colour-scheme and material I'd really recommend it as it's so light and really sets it apart from the suits you find on the high street. All in all, this is simply the best item of clothing I own to date and the speed of which it arrived coupled with the helpful correspondence from Indy just made this experience effortless and a pleasure.